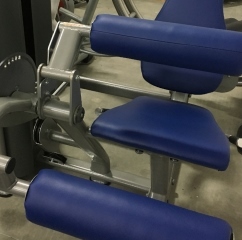 Refurbishment & Upholstery – Tower Fitness Equipment Services Inc.
Make Used Fitness Equipment Look New! Is your strength equipment still functioning well but looking tired and worn? Tower Fitness has proven experience in refurbishing old fitness equipment to make it look new again. Sometimes this path will fit your budget better than purchasing new fitness equipment. At Tower Fitness, refurbishment of strength equipment can include removal of the fitness equipment to bring to our shop, sandblasting, powder coating in the colour of your choice, re-upholstering in the colour of your choice, re-cabling and installing new hardware on the used strength equipment. We will then re-assemble the strength equipment at your facility once completed. Tower Fitness also refurbishes used cardio equipment. Contact us to find out more about how we can help you refurbish your existing fitness equipment.